On 15 April I flew from Newark, New Jersey to Port Au Prince, Haiti. I was traveling with a team sponsored by the Coty Group. This organization was founded some 28 years ago as an exchange between high school students in Massachusetts and students in Haiti. This trip was primarily a medical effort including two physicians, a midwife, and a nurse practitioner. 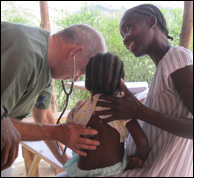 A clinic had been established at the Coty Project's location in the village of Desaub in the Caberet region in the mountains north of Port Au Prince. Thanks to the efforts of Dr Robert Brenner (Summit Medical Group, Berkley Heights, New Jersey), the clinic was receiving enhanced funding, management, and equipment. Dr Brenner used this trip as an opportunity to establish an electronic medical records program and set up new equipment at the clinic. During our nine day stay we saw patients at the Desaub Clinic, at a dispaced persons camp outside of Port Au Prince, and a remote village near Desaub. I spent one entire day taking a seriously ill infant for care in Port Au Prince. In addition, we took a day to visit the villages high in the mountains above Desaub. There I evaluated a young woman who had had a stroke and we met with the midwife (a delightful elderly gentleman) servicing these mountain villages. Despite the austere conditions at Desaub, this was a wonderful experience. Each of my fellow team members was superb. The Haitians I met were resilient, proud, and simply beautiful people.